Happy Friday! It’s the beginning of Memorial Day weekend and that means, at least in these parts, that it’s time to pack up and go camping for the weekend. Grilling, campfires, beach time, fishing, picnics, and all that fun stuff that camping entails. 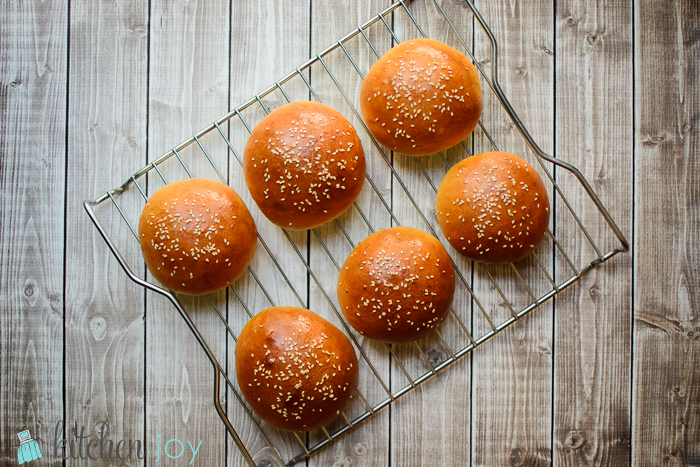 I’m sure that more than a few of you will be enjoying a burger or two in the coming days, which is exactly why I decided it was time to work on making some homemade hamburger buns, and let me tell you…They are SO much better than store bought! 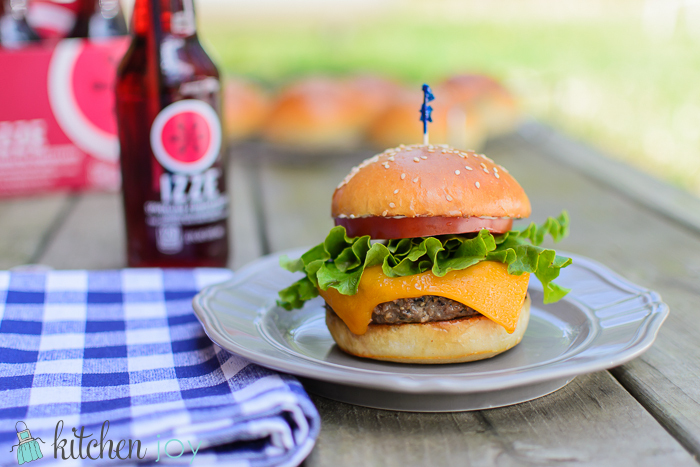 I’m not ashamed to admit that I’m a hamburger bun diva. My family has been raised on fresh baked buns from a little Dutch bakery in town, and they’re in a category all their own. 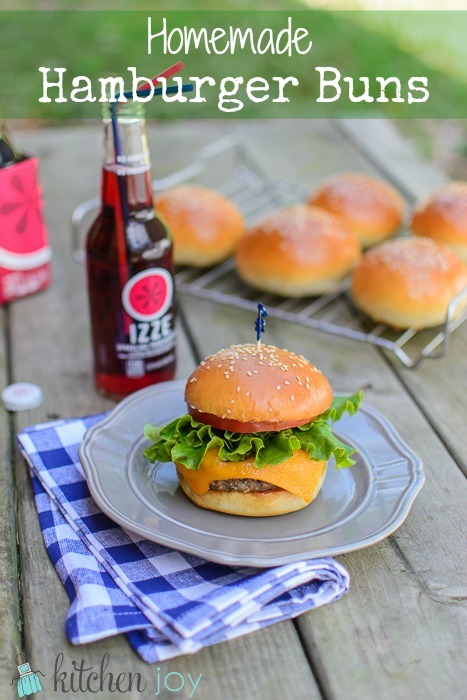 Store-bought hamburger buns are an entirely different species. (Have you counted the ingredients listed on the back of a package of store-bought buns lately? I quit counting at like 36…one of which was high fructose corn syrup.) Time for a homemade version. Stat. Aren’t they pretty? As soon as I took my second batch of buns out of the oven, I asked myself why on earth it took me so long to get round to making my own hamburger buns? I don’t really know. Maybe it’s because we very rarely make burgers at home. That’s going to change though, now that we’ve got these! We eat a minuscule amount of ground beef around here since I’m not much of a fan. However, if made correctly, I quite enjoy a good burger. (Confession: I love Five Guys.) My burger philosophy is simple: Good, fresh ingredients. Generously season the beef with salt and pepper. Grilled properly, not too dark and dry, topped with a nice slice of Cheddar, a tomato slice, crunchy lettuce, and mayo made with olive oil (no ketchup or mustard—GASP! Ketchup is for fries and mustard is for pretzels.) All of that on a lightly buttered and toasted bun. A good bun. A really good bun. 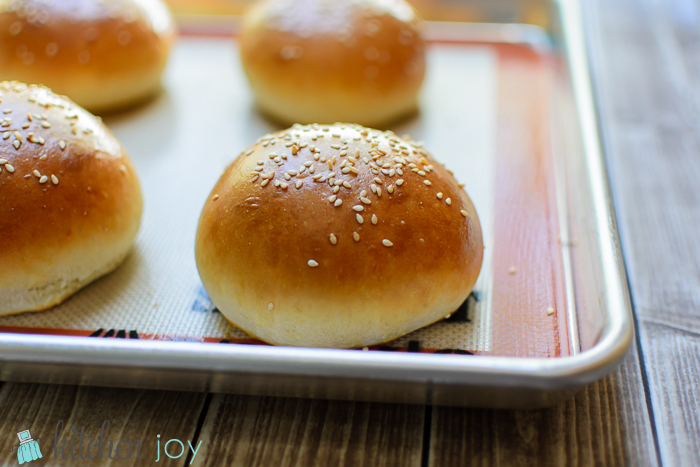 These homemade hamburger buns with sesame seeds, to be specific. In a large bowl, add the warm water and yeast. Let sit 5-8 minutes, or until foamy. Whisk in butter and honey. Add milk and egg. Whisk until combined. In a medium bowl, sift/whisk together the bread flour, all-purpose flour, and salt. Add flour mixture to the milk mixture and fold together with a fork until a dough forms. Let rise 1 1/2-2 hours, or until doubled in size. Roll each portion of dough into a tight ball and place on two parchment or Silpat lined baking sheets. Cover again with sprayed plastic wrap followed by tea towels. Let rise again 1 hour, or until doubled in size. Preheat oven to 410 degrees F. Make the egg wash by beating together the additional egg and water. Brush tops of dough with the egg wash and sprinkle with sesame seeds. Bake 15-20 minutes until golden brown and sound hollow when tapped. Cool on baking sheet for 10 minutes before removing to a wire rack to cool completely before slicing or storing. For best results: Store cooled, unsliced buns in an airtight container or bag. Enjoy within 3-5 days, although they're best the day they were made.